NORTHERN businessman Paavo Hatutale (47) and his partner Nicodemus Shekunyenge (21) made their first appearance in the Ohangwena Magistrate’s Court on Monday in connection with a truckload of dagga that was confiscated from them at the Onhuno roadblock. Hatutale and Shekunyenge were caught red handed at the roadblock in the Ohangwena region carrying 4 100 parcels of dagga last week Thursday. The duo was on their way from South Africa via Botswana to Oshakati when the truckload of dagga was intercepted. Police confiscated exactly 41 bags each containing 100 parcels of dagga which were found in a truck concealed amongst a consignment of wooden poles. The two accused persons were charged with possession and dealing in illicit drugs. 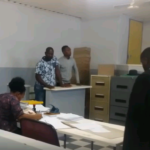 Magistrate Letta Simon who presided over the matter denied them bail and remanded them in custody until 8 March. Before the case was postponed to allow the police to further investigate the matter the Magistrate informed Hatutale and Shekunyenge that it is their right to bring a formal bail application before court before their next scheduled appearance. Meanwhile Ohangwena Regional Police spokesperson, Warrant Officer Kaume Itumba, said the estimated street value of the consignment of dagga is calculated at N$2 million, while the Regional Police Commander, Commissioner Simeon Shindinge, said that Oshakati was in all probability to be used as a distribution centre for the drugs.